Moving into September the summer is looking more like a thing of the past and autumn is well on its way. Moving into September the summer is looking more like a thing of the past and autumn is well on its way. While the mornings become crisper and the tree leaves put on their autumn show in all shades of red, yellow and brown we start to look at how this affects the world of fashion and design. While fashion is looking towards check and complex blending of fabrics, the design world is looking for bold statements of colour in contrast with monochrome backdrops. Looking at the style changes throughout 2014 and the past few years, our predictions for the next dominant shade and the potential Pantone colour of the year 2015 would be a shade of yellow. Its vibrant dominance shows a distinction with any main neutral room colour, however with the particular rise in trend of grey in room designs – yellow is the obvious choice. 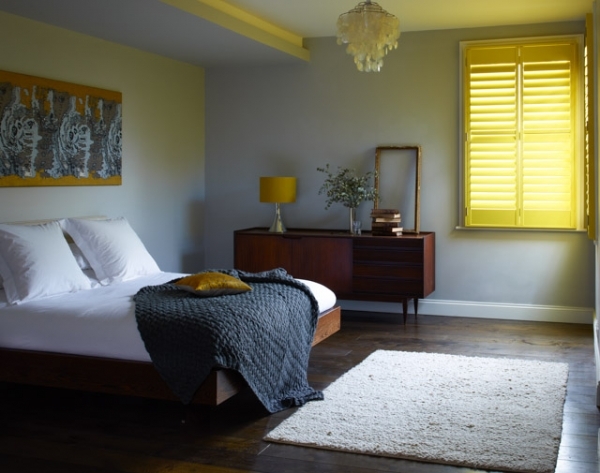 Shutterly Fabulous has been pioneering with distinctive yellow shutters since last 2012 as even minimal sunlight reflects through them to give a bright and cheery morning light. Custom shades can be matched from almost any colour you desire, so if you have a specific look you’re after – please get in touch.